Mazda repair and service doesn’t have to cost too much in Greenwood, IN. 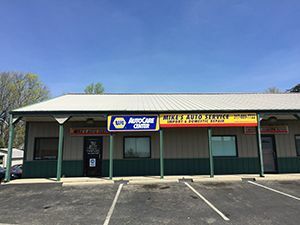 Mike’s Auto Service offers a wide range of automotive services for all Mazda models, old and new. We are ASE certified car mechanics that have decades of experience and extensive training. Whether you own a Mazda 3 or a Mazda SUV, our NAPA® authorized auto care center is fully-equipped to provide first-class service at an affordable price. We use all NAPA® and OEM auto parts for factory scheduled maintenance, minor repairs, major repairs, and more. Our skilled technicians have the expert knowledge, training, and resources to get your Mazda back on the road fast! We are a family owned and operated company, so we value good service and fair pricing. For this reason, we remain driven to provide high-quality automotive service at economy-based prices. Compared to the Mazda dealership, you can get service and repair at a fraction of the cost! At our shop, we use a focused approach to vehicle diagnostics and repair to ensure the job gets done right the first time, every time. You can rest assure knowing that your vehicle is our top priority when it’s in the hands of our qualified professionals. Call our office today at 317-889-7722 schedule an appointment for Mazda repair and service, or to request a quote.